Singtel’s headquarters in Singapore. Reuters. Singapore: Singapore Telecommunications , Southeast Asia’s largest telecoms firm, posted a lower-than-expected second-quarter net profit, as weak results from Indian associate Bharti Airtel overshadowed a better performance at SingTel’s Southeast Asian affiliates. SingTel’s profit has faltered in recent quarters as its mobile phone associates face maturing home markets and are no longer expanding as rapidly as before. “Singapore and Australia were slightly weaker, but affiliates, particularly Telkomsel and AIS performed better," Morgan Stanley said in a research note, adding that the biggest positive surprise came from Indonesia’s Telekomunikasi Selular (Telkomsel). 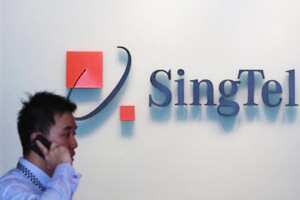 The Indonesian company contributed S$233 million to SingTel’s quarterly pre-tax profit. SingTel reiterated its outlook for low single-digit revenue growth in Singapore for the current financial year, and low single-digit revenue and EBITDA growth in Australia, where it owns the second-largest telecom firm Optus. It expects EBITDA, or earnings before interest, tax, depreciation and amortisation, from Singapore to be stable. Shares in SingTel, which is 55% owned by Singapore state investor Temasek Holdings , reversed early losses and gained 0.6% on Thursday. They have risen nearly 4% so far in 2011, versus a 10% fall in the broader market . The company said floods in Thailand have not affected operations at its Thai affiliate Advanced Info Service (AIS). On the contrary, there was an increase in usage in some telecom services at AIS because of the flooding, Hui Weng Cheong, SingTel’s CEO for international operations, told a media briefing. SingTel, the biggest company in Singapore by market value, earned S$882 million ($685.3 million) in net profit for the second quarter ended 30 September , down from S$892 million a year ago. The profit was below the average estimate of S$900 million of eight analysts surveyed by Reuters. Revenue rose 3.9% to S$4.6 billion as the total number of subscribers, including at associates, grew around 15% to 424 million. The company kept its interim dividend unchanged from the previous year at 6.8 Singapore cents a share. Bharti, India’s top mobile phone operator, was the biggest drag on SingTel’s earnings. The Indian firm’s contribution of S$131 million in pretax profit represented a drop of 37% from a year ago. Bharti last week reported a bigger-than-expected 38% fall in second-quarter net profit. SingTel has a 32.3% stake in Bharti. SingTel said Bharti’s African operations suffered fair-value losses from the revaluation of dollar-denominated liabilities following a sharp depreciation of several African currencies during the three months ended September. However, Bharti has completed IT, network and business process outsourcing in Africa and cost efficiencies are expected to materialise gradually in coming quarters, it said. J.P. Morgan analyst James Sullivan said he remained bullish on the outlook of Bharti’s performance with more than half of the addressable market available to be captured with the right pricing strategy. “This is the market where you have effective 50% penetration rate, so there is still a lot of subscribers that you can attract to gain revenue growth," Sullivan said.